New Delhi: Assaults on doctors at the hands of patients relatives, friends or public at large were taken up at a meeting of the Delhi Medical Council on Friday. 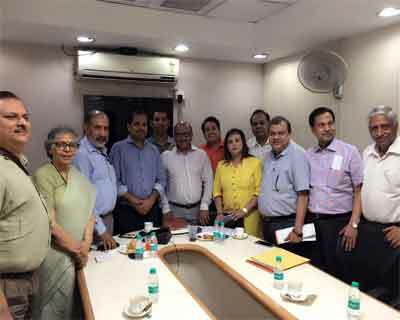 Council members, representative from police, representatives of the Federation of Doctors Association (FORDA), Indian Medical Association (IMA), and Delhi Medical Association (DMA), were present at the meeting and discussed matters related to patient doctor relationships. The aim of the meeting was to find solutions to the rising number of assaults on doctors by agitated relatives of patients across govt hospitals. Earlier the number of cases reported were far less, was an observation made by members attending the meeting. “The DMC members decided to come up with a white paper in their forthcoming meeting on how government bodies, public, doctors and the DMC should respond to situations like machinery breakdowns or non availability of medicines,” said Dr Girish Tyagi, Registrar, DMC. “There will be clear guidelines on how to deal with the situation if there is a shortage of manpower or a machine is not in a working condition. The role of government or police will also be analysed in such situations,” expressed DMC members. Recently vandalism was on display at Dr Baba Saheb Ambedkar Hospital in Rohini when relatives of a patient went on a rampage inside the emergency ward and the minor OT, after an injured patient succumbed to his injuries at the hospital. Six were arrested and booked for ‘rioting’ and ‘use of criminal force to deter a public servant from discharge of duty’. “Doctors are not being able to carry out their duties in a secure environment. The DMC will actively take up such cases with the authorities and the government,” said Dr. Tyagi. Agitations by FORDA have been a repeated phenomenon, these agitations have centered around lack of security measures against doctors in the emergency wards at government hospitals. Resident doctors have also time and again gone on strikes for better working environments. “Some possible solutions like the public being sensitised through media, advertisements; single entry point at hospitals; special security attention to women doctors, and that the DMC following all assault cases have been discussed in the meeting. Another meeting has been scheduled for later in the month,” said Dr. Pankaj Solanki, President, FORDA.